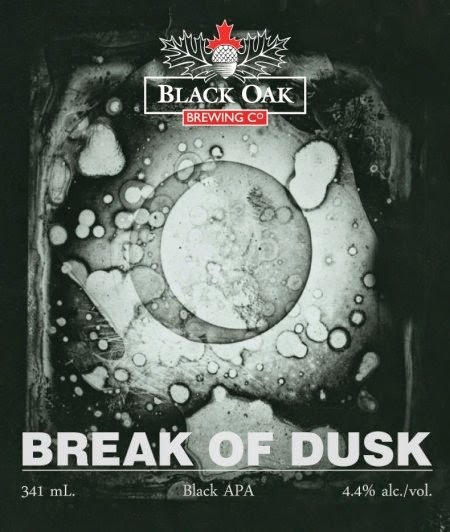 In this month's Beer of the Month delivery were four bottles of Break of Dusk from Black Oak Brewing. This 4.4% Black American Pale Ale was released near the end of December but I never had a chance to make it over to the brewery to pick some up. I was very happy to find this in this month's delivery. Break of Dusk is a 4.4% abv Black American Pale Ale that is described as follows: Brewed as a hybrid style of Stout meets American Pale Ale, this unique beer fuses dark roasted malts with bold citrus American hops to create a rare brew. With a lovely black mahogany glow and the kind of creamy head you would expect to see on a stout, the aroma is a subtle mix of pine, resin and citrus, packing a lot more punch in the mouth. A wallop of pine contrasts the robust coffee and dark coco malt, giving this triple dry-hopped beer a complexity on the palate that is unforgettable. I tasted this before I read the tasting notes or description and the first thing I noticed was the creamy head. Not a silky head but a very creamy one. The roasted malts give off a coffee aroma. I had expected chocolate but I found coffee really came through. With my first sip, a very nice bitterness makes itself known. It's not one that comes from the hops but is filled with the taste of coffee and coco. A slight bit of chocolate seems to calm the bitterness before the hops/coffee/cocoa comes through in the finish. I hope for two things. One is that Black Oak have this on tap tomorrow at the Roundhouse Winter craft Beer Festival tomorrow, as Teena and I will be there and two, they have not sold out at the brewery. I will need to get more for the house! One last cool thing. I usually don't write about the labels but this one is interesting. The image on the label is the first ever photographic image ever taken of the moon. it was done in 1840 by John Draper using mirror-reverse daguerrotype process.